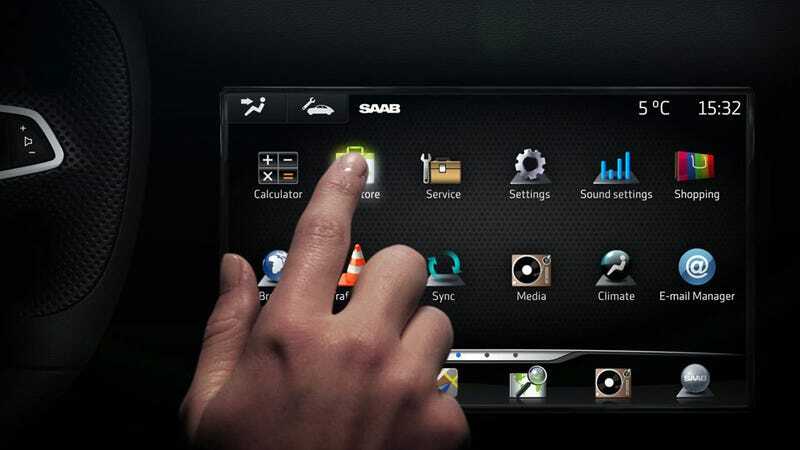 Swedish carmaker Saab will be the first major manufacturer to bring an Android-powered infotainment system — called iQon— to market next year. And unlike closed systems in other vehicles, Saab's turning over 500 inputs from vehicle sensors to third-party developers. Saab sells fewer cars in the United States than almost any other major manufacturer you can name (just 658 cars last month), due mostly to being starved of product and attention by its former owners GM. Now in the hands of someone who wants to see the company succeed, Saab can pull of projects like power a car by Google's Android open-source operating system. So how does it work? Accessible through an 8-inch capacitive touchscreen connected to the outside world via 3G or 4G wireless broadband, the customizable system allows access to the normal mix of entertainment, navigation, communication, travel information, and vehicle diagnostics. Go deeper and iQon also offers in-car web browsing, social networking apps and useful utilities like a calculator. One of the benefits of using such a system is it offers the ability to update it completely as the car ages, as opposed to being stuck with an OS as old as your car. But for enthusiasts, the most important feature may be access to the vehicle's sensors. Saab's already promised real-time feedback showing driver workload, yaw rate, steering wheel angle, and engine speed/torque. Most of this information is already available if you jack into the car with an aftermarket device, but the promise of turning this information over to developers means having performance data pumped and saved directly into the car — transmittable to your phone/laptop — without the hassle. The flipside of allowing this access is the ability for those with ill-intentions the ability to muck with a car's displays and, perhaps, vehicle systems. A Saab spokesman told Translogic this won't be possible due to firewalls between developers and critical safety systems. For the average driver, being able to add as many distracting apps as possible probably has its appeal. For our part, we're moved the ability to remove as many as possible (delete shopping app) and create a dramatically simpler, performance-oriented display. The car will go on sale sometime next year in the 2012 Saab 9-3, which will share a platform with the aesthetically pleasing Saab PhoeniX concept.